Students with special needs require extra consideration in all aspects of their environment, not least in the ergonomics of the furniture they use. Working height is a major factor in making furniture comfortable to use. Klick have a smooth, simple system of adjusting furniture leg length which allows worktops to be raised or lowered quickly and easily which is ideal for special needs schools. Adjustable height units can be fitted with a wide range of work surfaces and can include sinks, hobs and other services to suit a huge variety of purposes. Benches can be controlled manually or by means of an electric motor and can be either free standing or incorporated into a run of fixed benching. If your science laboratory needs to cater for pupils with special needs at least one adjustable height unit should be provided with a sink, gas tap and electrical socket. 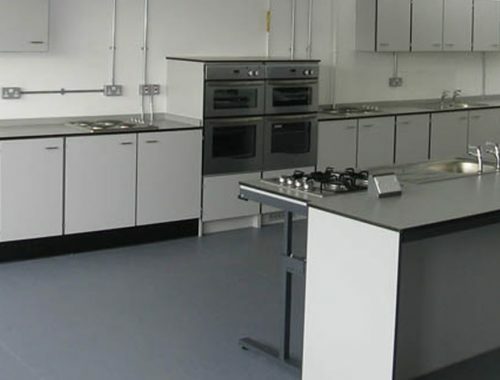 A food technology room which is to be used by students with special needs ideally requires an adjustable height hob, a sink and table and an oven in a special housing with a door opening to the side above the legs of a wheelchair user. 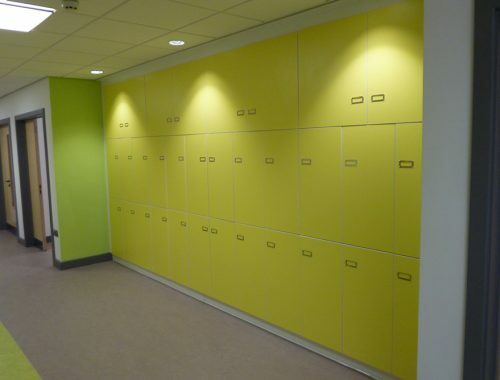 Klick Technology were called in to supply and install three areas of bespoke storage at the Apperley Centre, Gloucestershire. Klick made the job very straight forward, with clear design information and helpful staff. The project ran smoothly with the minimum of fuss and the clients are very happy with the end result. Looking forward to working with Klick again in the future. Browse our latest Special Needs Case Studies using the arrows below or click to view all case studies.